Ok, this might not be everyone's cup of tea, but I'm sure some of you may like this one. You might even order this, and donate it to your local library, whether it is a public library or a school library. Teachers love magazines. They use them for student projects. 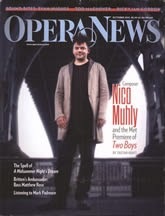 Anyway, you can get a free subscription to Opera News. This is from Free Biz Mag. It is completely free, and there are no automatic renewals.